Horizontal tracks are fixed directly to the wall at a distance of 40 cm. 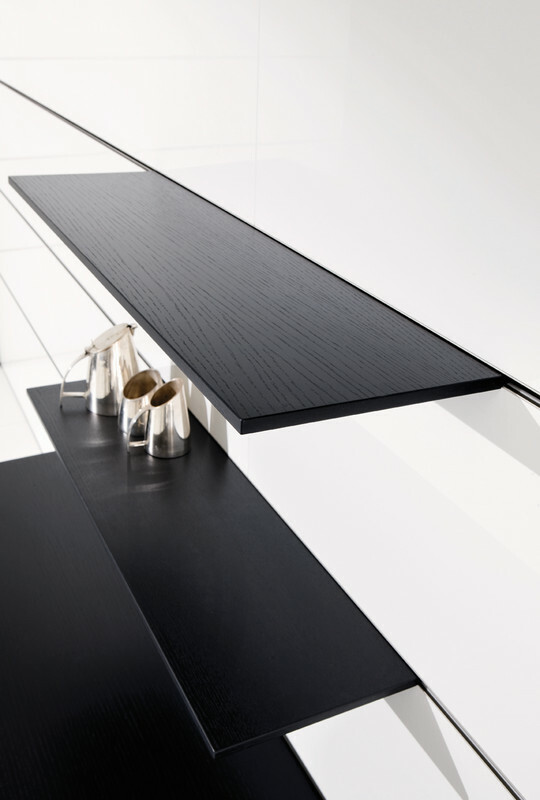 Various Paneel elements can be suspended in between, such as shelves, cupboard boxes (with or without sliding door), table element supported on metal runners or even light rails. Paneel 40 is a wall mounted furniture system to extend the design possibilities from kitchen to living room. While the planning grid is orientated on the kitchen, the furniture elements address the requirements of living room comfort. The appended narrow elements divide the room without encroaching on the living space. Colours and surfaces can easily be matched to the kitchen if required. The wall system is divided into 40 cm high panel rows which are connected through metal profiles. They are fixed to the room wall and have channels to the front into which the various elements are suspended.